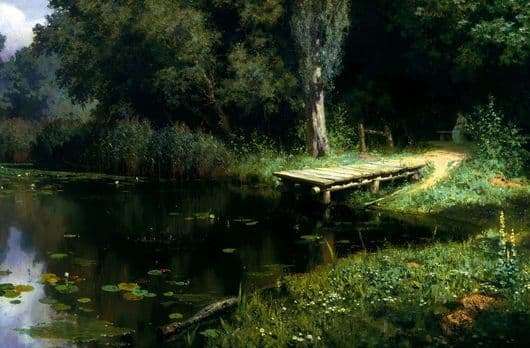 This picture was painted by Polenov in 1879. Here he depicted a quiet and peaceful picture of Russian nature. The canvas does not hit us with rampage and a variety of colors that excite feelings. On the contrary, the picture is filled with light, peace and tranquility. Before us is an ordinary pond, lost in the shadow of ancient trees. There are many such corners in our country. This is something close and dear to every Russian person. Therefore, the picture Polenova and draws, near her soul rest. The composition of the picture is kept on the diagonal lines. They go in different directions, outlining the boundaries of objects and creating a holistic image of the picture. The banks of the pond, the bridge, the path – all this is drawn with the help of diagonals. This technique gives the canvas volume and builds perspective. The picture is literally buried in verdure. Dark green crowns of trees create a thick shadow and give a feeling of coolness. The same greenery is reflected in the calm and motionless, like a mirror, the smooth surface of a pond. Water lily leaves and duckweed islands float on the surface of the water, so the pond looks so real, alive. Among the green sea of ​​foliage, the bridge and the path lead us deep into the forest. Looking closer, we see a bench in the shade of the trees, and on it – a small female figure. The presence of a person does not violate the silent tranquility of nature. The stranger is part of this nature, her posture is relaxed, she enjoys a summer day. The picture almost does not show the sky. Only in the upper left corner of the picturesque canvas we see a small fragment of a pale blue sky covered with clouds. But still, the picture “Overgrown Pond” is full of sunlight. We notice him on the surface of the grass, we see sun glare on the water surface of the pond. Vasnetsov’s canvas leaves a feeling of peace, pacification, fertile silence and summer relaxation.